Step inside, we’ve been expecting you! At long-last, Arrow Video is proud to present the first two installments of hit horror franchise House on Blu-ray for the first time! Meanwhile, House II: The Second Story sees young Jesse (Arye Gross) moving into an old family mansion where his parents were mysteriously murdered years before. Plans for turning the place into a party pad are soon thwarted by the appearance of Jesse s mummified great-great-grandfather, his mystical crystal skull and the zombie cowboy who ll stop at nothing to lay his hands on it! From the team that brought you Friday the 13th, House and House II are era-defining horror classics now newly restored and loaded with brand new extras! 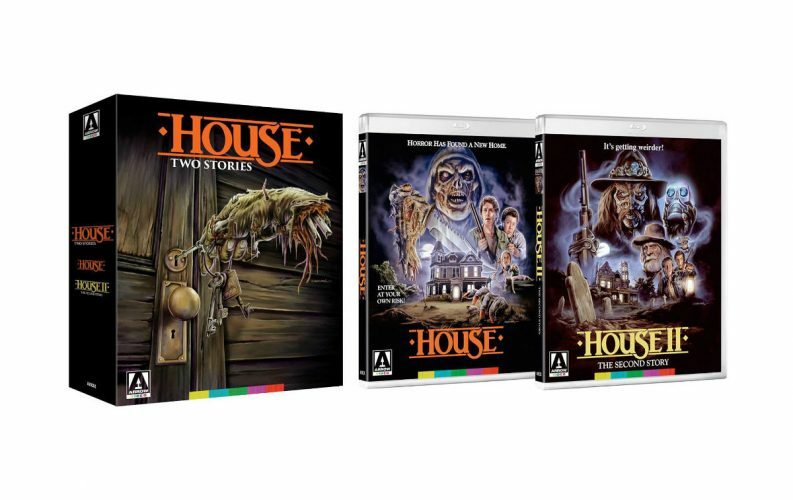 House Two Stories is a Box set with two films called House and House 2 The Second Story. The US edition got two films but the UK has all 4 films so if you have a region free Blu-Ray Player and you’re a fan of the House films I would pick the import up. When will we see the other two films in the States? No Idea but part 4 has never been on DVD. House 3, Shout has got the rights and is available on Blu-Ray in the Name of The Horror Show which is like the film Shocker. On that Note it really makes no common sense to be even considered House III as its only connected to House not by plot but only connected because of the crew who worked on the film. House 2 is on that same level if it really should be called a Sequel but it relates way more than the third film. Over the set as a whole is good to look at with nice extras, the First film is a Classic must see but the second film might disappoint some. With that said who whole set gets a 4 out of 5. Check below to see what I think about each film in this set. House is a Classic Horror Comedy that is a Mix of Evil Dead and Poltergeist. The film is about a writer whose aunt killed her self in her house. This house has history, its a place where are lead named Roger Cobb a Vietnam vet has lost his child in. Roger moves in so he can’t write his book about his time in The Vietnam war but things just keep happening. Horror elements increase as the film moves on. His Son might still be alive trapped in the house and his old buddy from Nam shows up in skull and bones to settle a score. The Movie was a fun watch, great story and love the comedy elements. It’s not a ton but it helps make the film more fun. Yes we have some plot holes that could have been filled with a bigger run time but it doesn’t hurt the film too much. Acting wise its great thanks to are lead and the neighbor played by George Wendt (Cheers, Gung Ho). Comedy was fun and the film has some nice live effects including a big fat lady rubber suit thing. The Closet Monster was great but the best was the last one that appears who is a friend of are lead. The effects were evil dead like including its comedy. Overall the film was a great watch and looks great on Blu-Ray. Fill some plot holes and a little bit longer run time and its a 5. With that said I give House a 4.5 out of 5. Classic horror, Not to scary but its a great film from my childhood that still holds up. House 2 The Second Story is a Comedy Horror film that’s a Sequel to House but not Directly. Yes its Horror, It has Comedy, We have a House and we have dead things walking around. Now the Plot is different and doesn’t relate to the first film, The Actors are all different and this film is more comedy then Horror. Arye Gross Plays are lead whom moves into a House that was owned by His Parents whom died when he was a Kid . This house has been in the family for a much longer time. Before he moves we get to see his parents die by a western skeleton Creature who does look cool looking for the Crystal Skull. Now the film does get kind of Indiana Jones in portions of the plot. Years Later are lead move in who reads a few thing has found talking about the skull. He finds it in a grave burred with his great great grand father who comes backs to life to help Jess, Main leads character name. Through out the film we have adventure and a few creatures who want that skull. The Plot is OK and does take from another films some. Compared to House this film is less horror and more comedy which may hurt the film. The plot is also more loopy. Acting wise its good we also get a young Bill Maher who steals Jesse’s Girl later on. Not much gore or horror but we do get some scary monsters, just not real scary and some times are more comical than anything. The only scary Monster is the western skeleton who knows the dead great great grandfather who also talks with a western accent. Over all the move was an OK watch, Just does not stack up to the first film. I was more disappointed in the fact it was a comedy more so then a Horror film which made the first one great is that it was more horror with some comedy. Take out some of the more loopy stuff like the creature that act like a pet dog and the bird thing and fill the spots with scary horror creatures.